Do you have a set of standard rules you follow when working on your family tree? Some common sense rules can steer you away from people who have no place in your tree. There will always be lots of exceptions to these rules. But having them as your foundation will help guide you in your research. Let's focus on rules related to a person's age. Here are 4 rules for you to consider. Depending on where and when your ancestors lived, you may find a pattern. If you can look at a bunch of marriage documents from your ancestor's town, notice the brides' and grooms' ages. 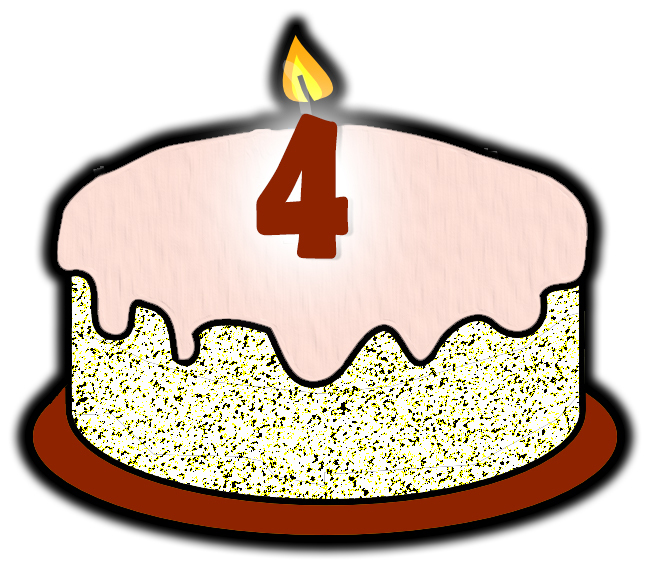 What was the customary age to marry? Setting aside the widows and widowers who are remarrying, how old are the couples in general? Let's say you find a lot of people getting married between the age of 23 and 27. Take note of that! That's probably the customary age for marrying in that town at that time. To put this rule into action, imagine you've found an ancestor's birth record. Now you'd like to find his marriage record. You can jump ahead 25 years (or whatever age the evidence tells you) and start looking. You may have to check a bunch of years, but you also may get lucky pretty quickly. Note: If you're finding some ridiculously young brides and grooms, like ages 12 through 16, look at the details. Are their parents all alive? Many times a terribly young daughter is married off if her parents have died and her grandfather wants someone to provide for her. age based on local customs. Forget about men. They can make babies practically forever. But women have a limited amount of years during which they can possibly have a baby. Being practical, the women in your family tree were probably capable of having a baby from age 16 to about age 48. You can expect your ancestor to have had her first baby as soon as one year after her marriage. And she most likely continued having babies every couple of years until she was too old. To put this rule into action, be very skeptical of adding a baby in your family tree to a mother who's more than 48 years old. (The poor woman!) Some family tree software will alert you if you're giving a woman a baby she wasn't likely to have had. When did your foreign-born ancestor immigrate to your country? 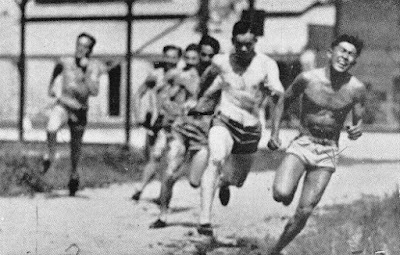 Depending on the era, it may have been a difficult journey of two weeks to two months or more. I can't imagine how awful that was. On my last 9-hour flight home from Italy I thought I was going to die of discomfort and lack of sleep. When I saw the movie "Brooklyn" about a 1950s journey from Ireland to America, I felt that I, too, would have been throwing up. A lot. To put this rule into action, figure on your ancestor making that journey no later than their 40s. In my tree, most of the men who came to America to work came in their 20s when they were able-bodied. If they brought their families over, they did it in their 30s or 40s. My 2nd great grandparents and a cousin were pretty old for this 1898 journey. If you don't know when your ancestor came over, start by looking at the years they were in their 20s. This is the simplest age-related rule. Don't expect your ancestor to have lived more than 100 years. Maybe you've got fabulous genes and have an ancestor who lived to be 115. But in general, you'll probably find it unusual to have an ancestor who lived that long. To put this rule into action, look at the average age of death in your ancestor's town during their lifetime. If no one else is living beyond their 70s, your ancestor probably didn't live beyond their 70s. Use that knowledge to narrow down the years when your ancestor may have died. Don't forget to look at your ancestor's children. Their marriage documents can tell you if their parents are alive or dead at the time. These are pretty logical rules. You can make them more scientific by learning all you can about the place where your ancestor lived. Make logic work for your family tree! "What? I never downloaded the 1940 census for my great uncle? Which other families haven't I gathered documents for?" An 1899 birth record for my ancestor. I've written several times about my "document tracker" spreadsheet (see links at the bottom of this article). I use it to keep an inventory of every document image I've attached to someone in my tree. It's alphabetical by last name and has a column for each major type of document or fact. Birth, immigration, marriage, census, draft card, death, etc. One of my 2018 Genealogy Goals is to "Fill in the 'Need to find' column" on my spreadsheet. That involves looking at which documents I've gathered for someone and listing what is still missing. For example, if I have the 1910, 1930 and 1940 census for a person, the 1920 census belongs in my "Need to find" column. I hadn't spent much time on that, even though we're well into July. And then something went wrong. I noticed when I tried to re-sort the spreadsheet by the Person's Name column, a group of lines were being selected. It looked as if Excel was going to sort only those lines. I use Excel every day on the job. I've never seen this happen before. I avoided sorting that day, but I guess I made a bad sort another day. This weekend I discovered the error. When I looked to see if I'd added the 1871 marriage record to my 2nd great grandfather's line, I saw all the wrong information! It seems as if a lot of lines are off by one, containing dates for the person above them. The spreadsheet has 1,685 lines. I need to check them all! Since I noticed this terrible problem while looking at my Saviano family, I decided to start there on line 1,464. I checked each line against Family Tree Maker to see which data belonged to whom. To do this I clicked the Person tab, and then the Media tab in FTM. As a rule, I label all media items beginning with their date so they sort chronologically. I label each person's media files beginning with the date. Now they display in chronological order. I've recently gotten into the habit of adding "cert." to my spreadsheet when I have an actual certificate image. For example, in the Birth column it may say "1846 (cert.)". So I thought, why not add the person's birth year when I'm sure of it but have no document? I'll know there's no image because it doesn't say "cert." Those birth years are really helpful for telling my five Antonio Sarracino's apart! And while I was checking each person's documents, I completed their "Need to find" column. As I finished each line, I gave the row a light green color. Now it's plain to see which lines I've checked. I'm fixing any alphabetical-order errors manually to avoid future problems. When I add a new person, I'll have to insert a new line where their name belongs. My document tracker spreadsheet holds my inventory and provides my task list. If this sounds like a lot of work, it is, but there's a big payoff. As I'm working through the lines of the spreadsheet, certain things tempt me. I discovered I was missing an immigration record for my cousin's great grandparents. I noted that in the "Need to find" column, but then I decided to go get it. I found it on Ancestry.com. I put the date in the immigration column for both the husband and the wife, and took it out of the "Need to find" column. 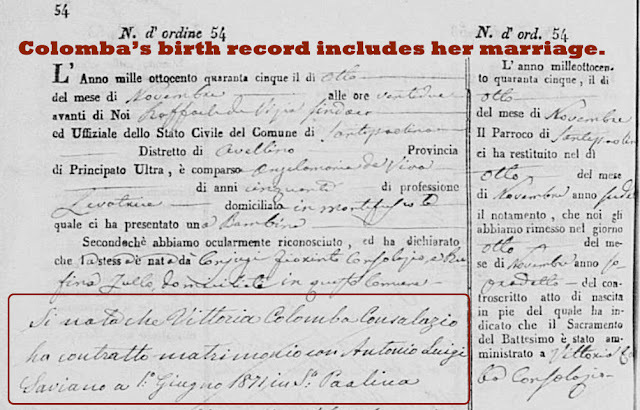 Then I found people from Avellino, Italy, who were missing their birth records. The Avellino records became available last week! So I downloaded and added their birth records. 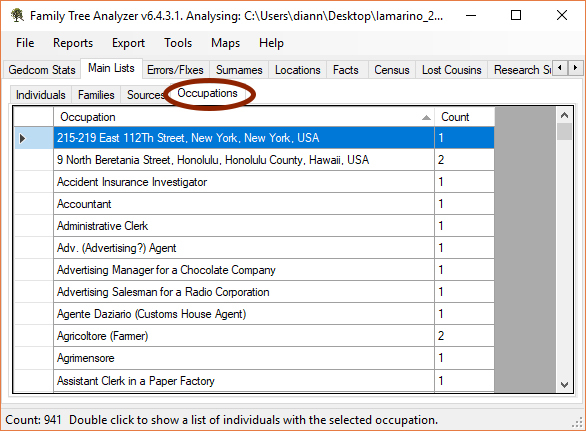 If not for this exercise, I wouldn't have realized I had Avellino people in need of documents. The ultimate goal is to have all the lines verified and shaded green, and the "Need to find" column empty. That'll mean I've tracked down every major document I can for each person. And if I can't find that 1940 census for my great uncle, at least I've got the ultimate short-list of what I need to find. We all get side-tracked by lots of things. We're working with a new cousin to firm up our information. 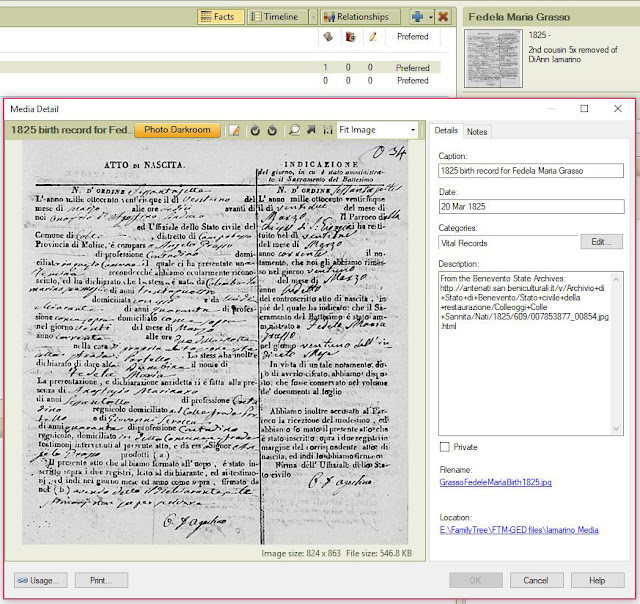 We're using new document collections to find lots more ancestors. We're trying to create trees to share with our family. This exercise can get you focused on what you've left unfinished. I'm more motivated than ever to work on my document tracker spreadsheet. If you give it a try, I think you'll be happy you did. 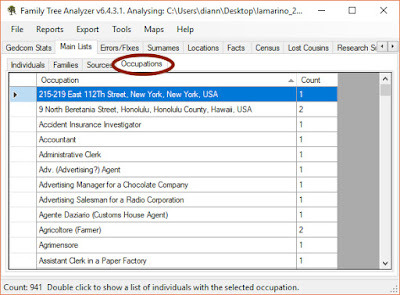 Note: Be sure to read the follow-up article about using free Family Tree Analyzer for some of these tasks. 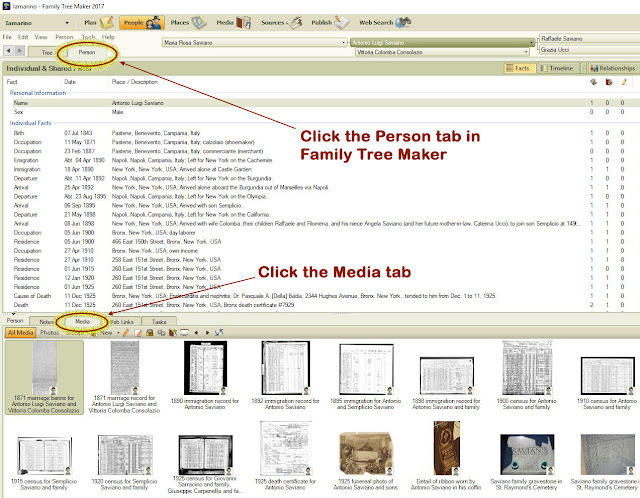 Use This Tool to Discover Family Tree Insights. 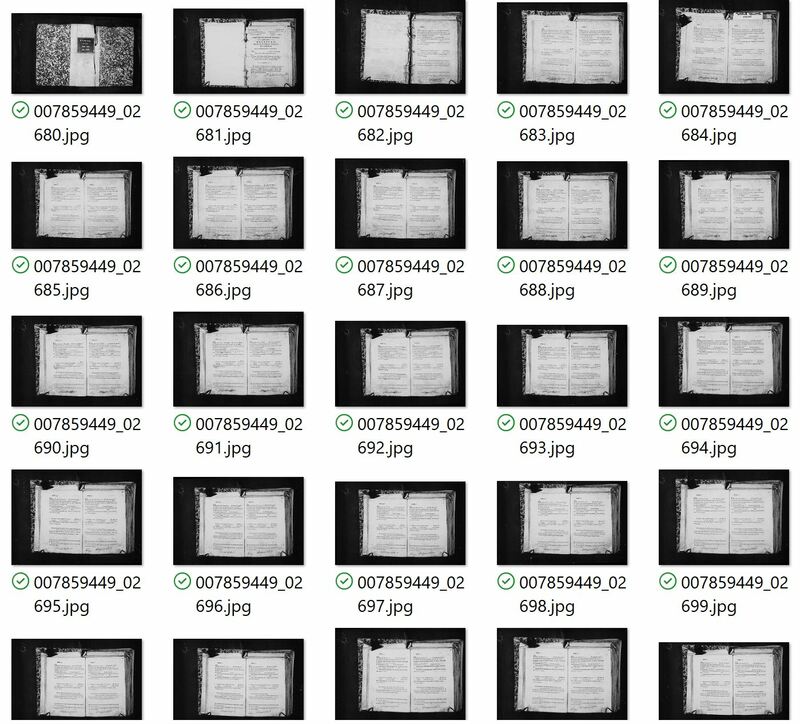 Seems like every day I read that a new genealogy document collection is coming online. Some are available through subscription services, but plenty is out there for free. If you stay tuned in to social media, you can learn about these new collections early. That's how I discovered a document collection I needed badly was coming online this past week. Finally, a branch of my family tree that's been a dead end was opening up. And I was ready. 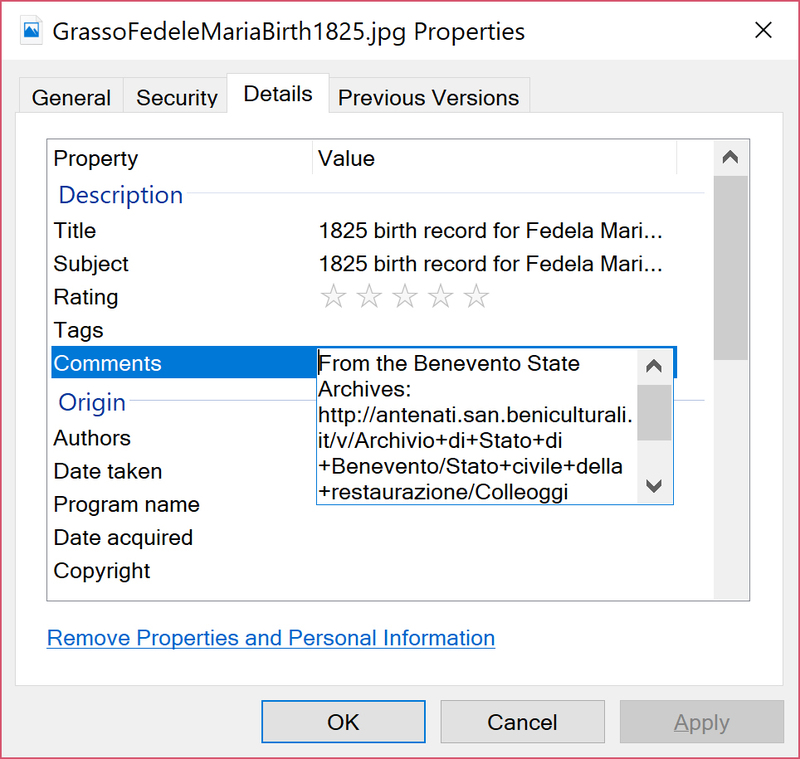 Even before the vital records from the town of Santa Paolina, Italy, were fully published, I was downloading them to my computer. 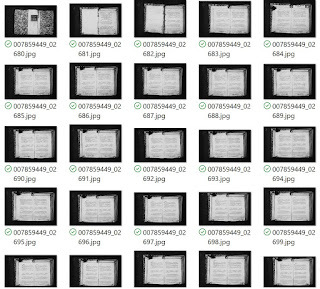 I now have all the available records from 1809–1945 to comb through offline. 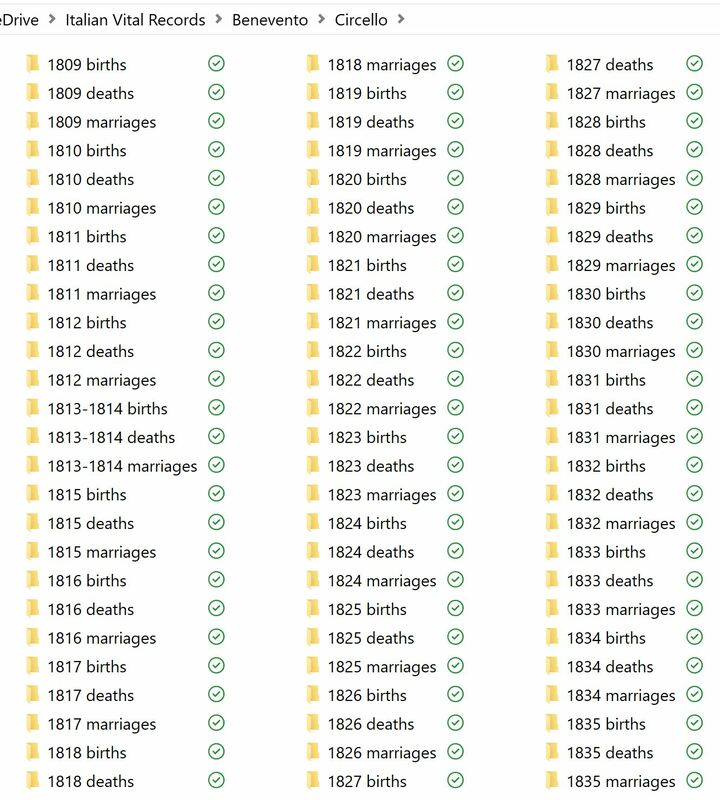 I stored the documents in 386 folders—separating births, marriages and deaths by year. I have no idea how many thousands of documents there are. Imagine this is you. Imagine these documents hold the missing information about your great great grandmother Colomba. 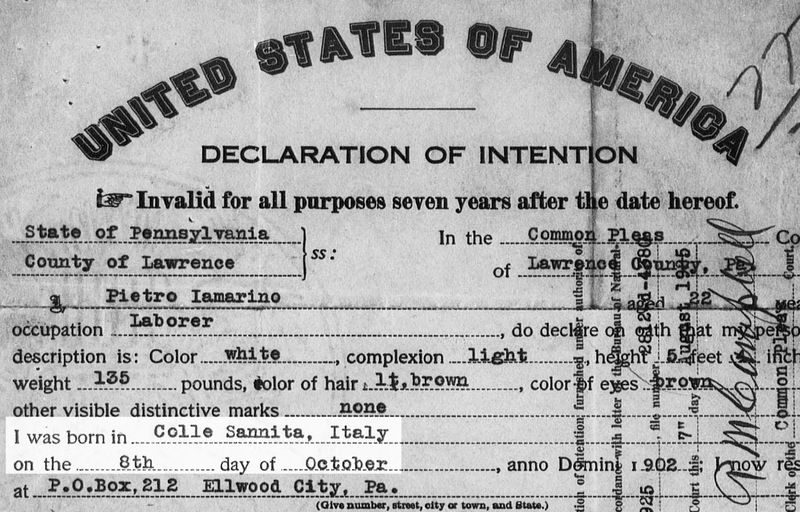 Colomba's 1920 New York City death record shows her last name was Consolazio and she was born around 1845, somewhere in Italy. 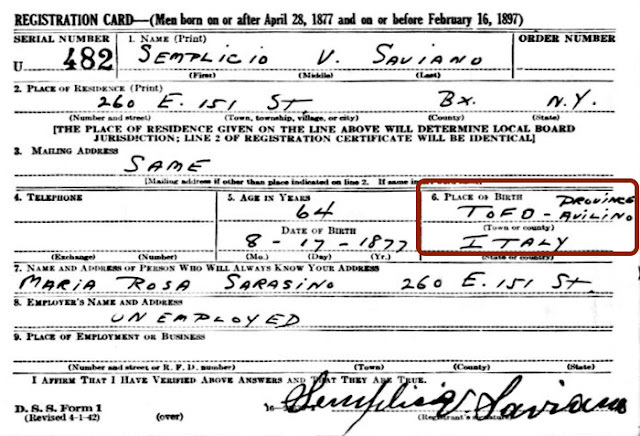 Her son's World War II draft registration card said he was born in Tufo, Italy. Last year I looked at microfilmed records from Tufo. I found two sons for Colomba plus a few Consolazio babies who were her nieces and nephews. It was their records that told me the Consolazio siblings were from the next town—Santa Paolina. I've been waiting impatiently for the Santa Paolina documents to show up online. Here's how I'm surgically extracting the most important records first. Hoping that her death record was correct about her age, I went straight to the 1845 births. I found Colomba! Though her name is a little different and her father's name isn't what I expected, I know it's her. On her birth record is a note of her marriage to my great great grandfather, Antonio Saviano. 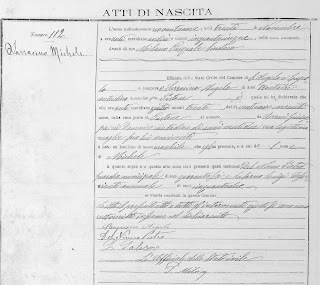 This is unusually lucky, but her birth record say my great great grandparents married in Santa Paolina on 1 June 1871. 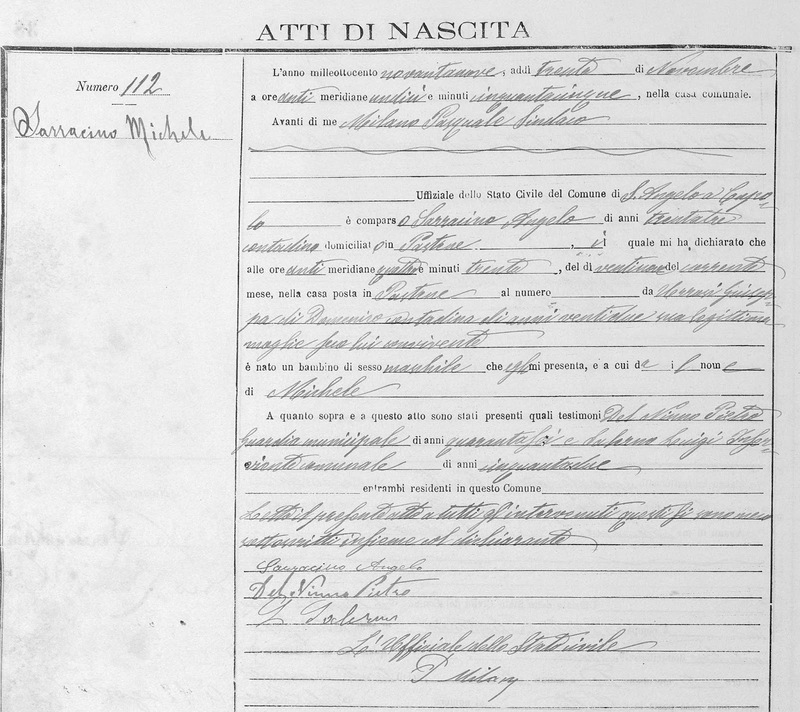 This 1845 Italian birth record includes the addition of her husband and marriage date. Santa Paolina's marriage records are a different format than I'm used to. But they gave me important facts I'd been missing: My great great grandfather Antonio's parents' names, occupation, and town of birth. It also confirmed his year of birth. Knowing my ancestors married in June 1871, I started looking for babies beginning in 1872. I also know from earlier research that this couple had baby boys born in the town of Tufo in 1875 and 1877. 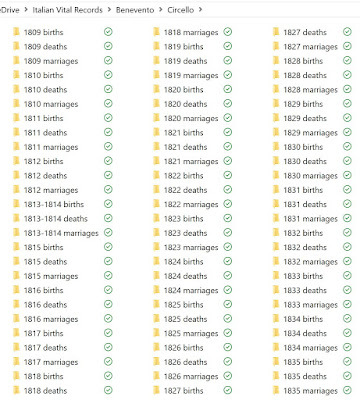 So I needed to check the birth indexes only for 1872, 1873 and 1874. I found one baby girl, Maria Grazia, born on 26 April 1872. 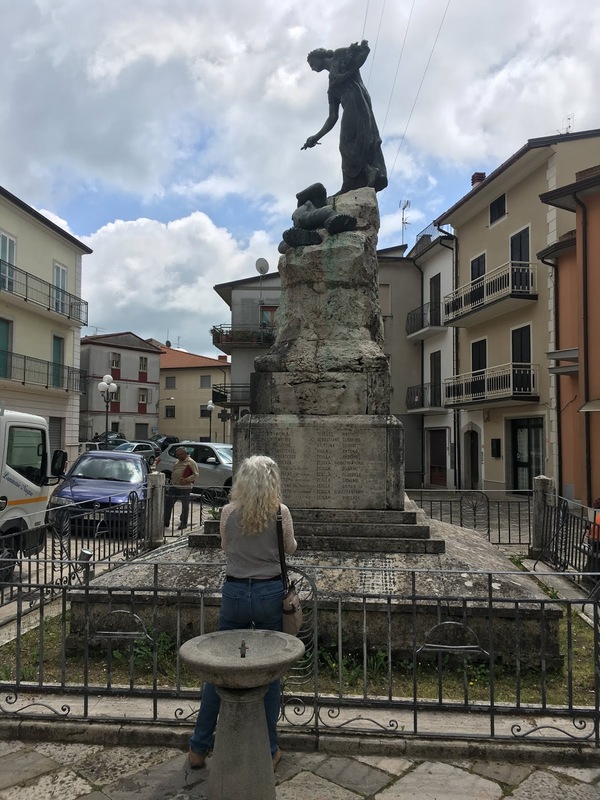 She and the two boys born in Tufo are my great grandmother's siblings. So I knew this little girl must have died. We simply have no Maria Grazia in the family. I was sad to find she died 4 days later. 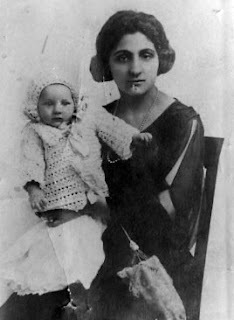 Maria Grazia Saviano, the first-born child of my 2nd great grandparents, died at the age of 4 days. These were Colomba's earliest babies. The rest of her children are well known to my family. They were born in another town called Pastene. And now I know that's where their father Antonio was born! But we can't stop there. We need to find Colomba's grandparents, and maybe her great grandparents. Colomba's birth record gave me names for her parents, but not their ages. Luckily Santa Paolina had a very small population. I subtracted 25 years from Colomba's birth year, bringing me to 1820. I began checking the birth indexes for 1820, 1819, 1818. 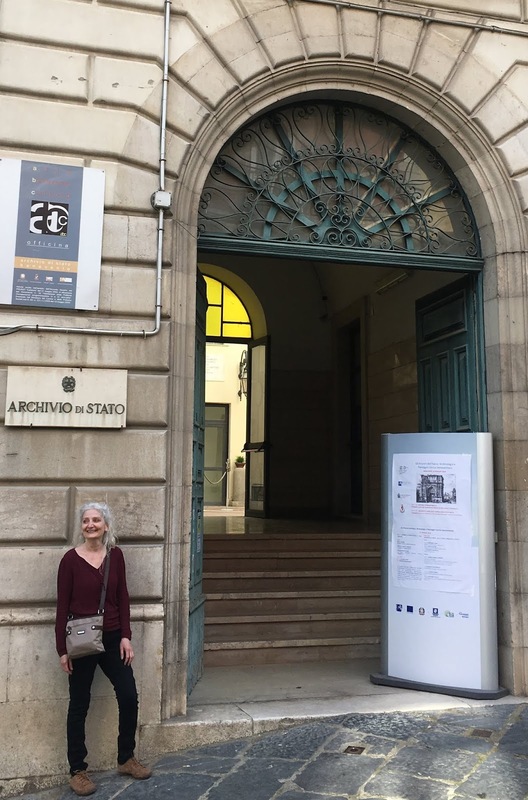 I found my 3rd great grandmother, Rubina Maria Censullo! Now I have her parents' names—my 4th great grandparents. Keep going. 1817, 1816. There he is! My 3rd great grandfather Semblicio Fiorentino Conzolazio. Now I have his parents' names—also my 4th great grandparents. Getting close to the earliest records, I searched for Semblicio's parents' marriage. He was born in 1816, so I looked at 1815, 1814. Oh my gosh, I found it! His parents, Gaetano and another Colomba, were married on 29 December 1814. The paragraph at the bottom includes the names of 4 of my 5th great grandparents. Now I have each of their parents' names. That's 2 sets of my 5th great grandparents. I can't find Rubina Maria's parents' marriage because they were quite a bit older. I'd need church records to find them. With one document collection, boom! 3rd, 4th and 5th great grandparents. Using targeted searches, I got the juiciest information out of this record collection in no time. But there's a ton more to find. 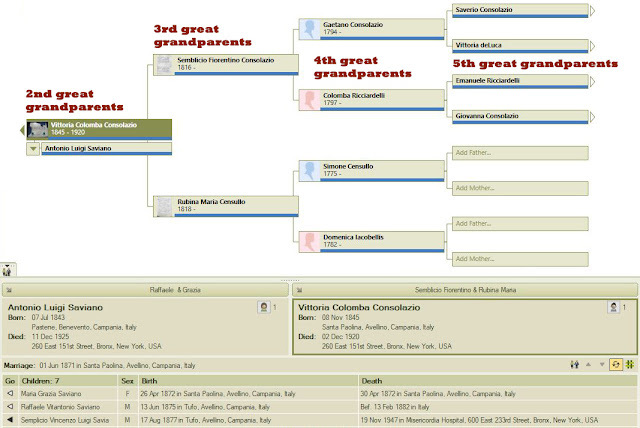 I want to find the births of Colomba's siblings, their marriages and their babies. I need death records for the 3rd, 4th and 5th great grandparents. I hope you'll try this methodical approach. First looking for very specific records, then expanding to the related records. Be logical and you'll go far. You can do this! 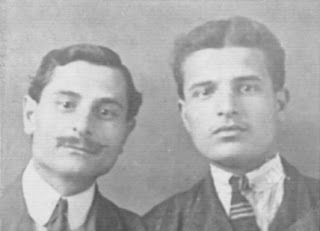 Growing up, I knew my grandfathers had come to America from Italy as young men. When I started researching my family history, I found their immigration records on the Ellis Island website. According to their ship manifests, each of my grandfathers were joining a relative who'd already made the voyage. Have you found a ship manifest for any of your ancestors? Are you squeezing every bit of information out of that page or two? If so, you know each passenger names someone they left at home, and someone who's waiting for them at their destination. The amount of detail depends on the year of immigration. If your ancestor came through Ellis Island, you'll find lots of information. A ship manifest holds lots of details about your ancestor. Where Were They From, Where Were They Going? When my Grandpa Pietro Iamarino arrived in New York City on 29 November 1920, he was leaving his "Father Iamarino" in "Collo Samino, Ben." First of all, thank goodness I knew his father's name was Francesco or I'd be mighty disappointed. Second of all, "Collo Samino, Ben." is a typewritten misspelling of Colle Sannita, with "Ben." being short for the province of Benevento. Again, thank goodness I knew the town name already. 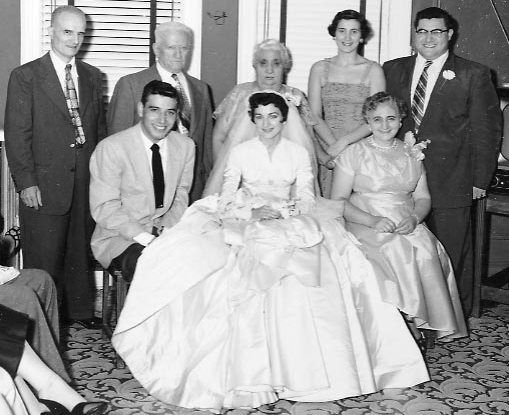 Grandpa arrived with $11 in his pocket to join his "Uncle Pilla Di Gennaro" at 22 West Street, Newton, Massachusetts. This lead was a dead end to me for quite a while. Over time, after I'd learned more about Grandpa's family, I realized something. The "Di Gennaro" part of that description meant that his uncle was the son of Gennaro Pilla—my grandfather's grandfather. So Grandpa was joining his mother's brother, Antonio Pilla, in Massachusetts. So what do you do next? You look for Antonio's ship manifest. Was he the first in the family to come to America, or was there someone before him? Antonio Pilla, my second great uncle, left Italy for Philadelphia seven years earlier in 1913. 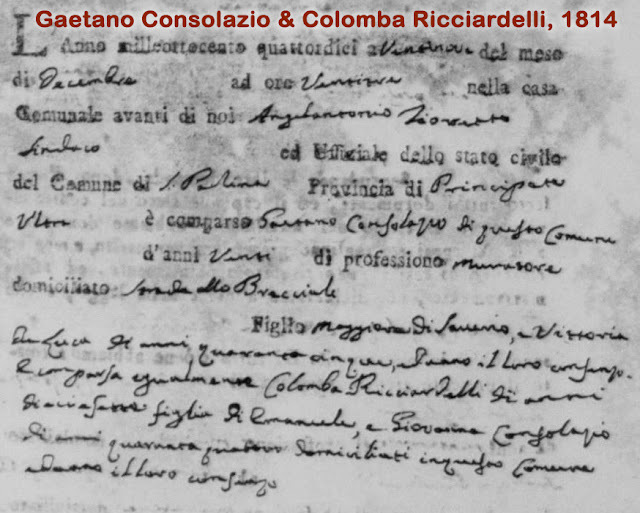 The ship manifest says he left his father Gennaro in Colle Sannita, Italy. He was travelling with his brother-in-law. Both men were joining Antonio's brother Innocenzo Pilla in Lawsonham, Pennsylvania, to work in the mine or for the railroad. Another link in the chain! Next I searched for my other second great uncle, Innocenzo Pilla. He sailed to Boston in 1909 with two of his brothers-in-law. One of them was my great grandfather, Francesco Iamarino. The group was going to the Bronx, New York, to join my other second great uncle, Francesco's brother, Giuseppe Iamarino. I can't seem to find Giuseppe's ship manifest, but he's in the 1905 New York State Census living in the Bronx. His seven-year-old son was born in Italy, so the family must have arrived between 1898 and 1905. My uncle Giuseppe may have been the first in that branch to come to America. That led to his two brothers and one brother-in-law following him in 1909. And that lead to my uncle Antonio joining his brother Innocenzo in 1913. 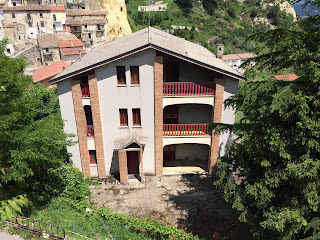 And that led to my grandfather Pietro joining his uncle Antonio in 1920.
hometown of Colle Sannita, Italy. And what's the best thing about this kind of chain migration for a genealogist? You get to discover more family members. Add dates and locations to their timelines. 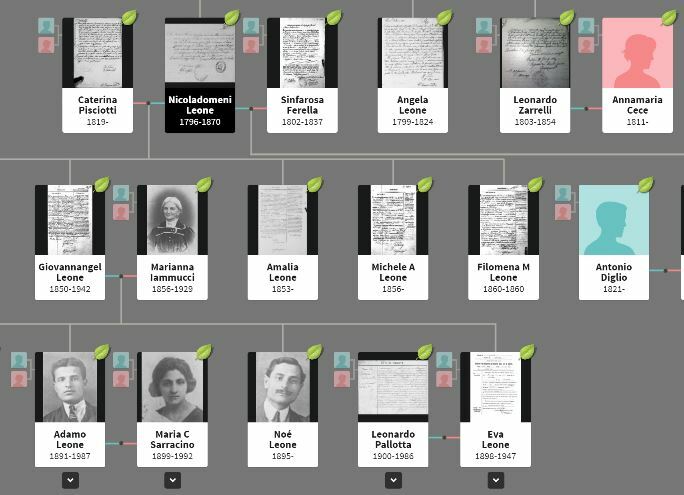 Find documents for relatives—even if they went back to the old country. My great grandfather Francesco didn't stay in America. But I've found ship manifests for him in 1903, 1909, 1913, and 1929. He came to join his brother Giuseppe the first three times. He stayed and worked for the railroad for a while, then went home to his wife and daughters in Italy. On his final trip in 1929 he visited his son Pietro, my grandfather, in Youngstown, Ohio. He may have worked for the railroad for a while. Or maybe he came to meet his son's wife and baby daughter. Follow the path of the relative or friend your ancestor joined when they immigrated. You may unwind a series of sea voyages and a bunch more relatives. Thank goodness our ancestors had the strength to make such a difficult journey—sometimes over and over. You've got to admire what they did to survive. You've got to admire their courage. Be proud of your ancestors. And keep honoring them by documenting their lives. Six months ago I wrote about my general approach to genealogy research. 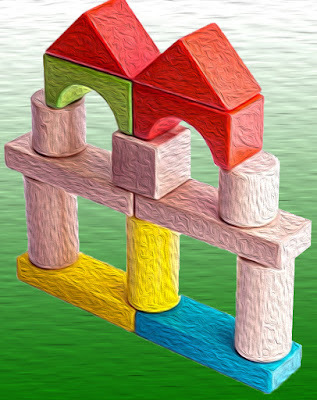 Let's look at the specific building blocks that can make anyone a productive and efficient family tree researcher. I don't want to short-change any of these concepts, so this article is in two parts. You'll find a link to part 2 at the bottom of this article. Did you make your list of genealogy goals for 2018? I made a list that I look at anytime I feel like I'm searching for documents without a specific goal. Come back to your goals again and again and whittle down the list. I spent five years making trips to my local Family History Center. 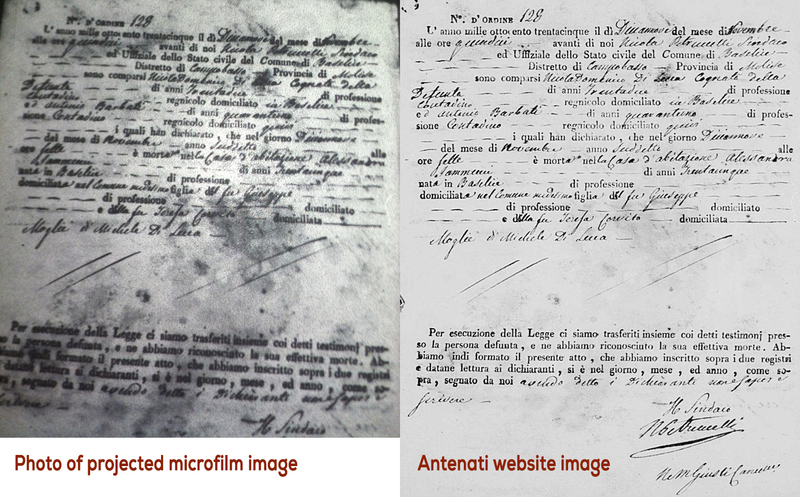 I ordered microfilm (it's available online now) from my maternal grandfather's hometown in Italy. I knew nothing beyond his parents' names, so I wanted to find out more. I soon realized I couldn't tell who was related to me unless I pieced together all the families. So at the center I typed the data from each birth, marriage and death record. At home I entered it all into Family Tree Maker. In the end, I had a tree with 15,000 people. More than 10,000 of them had a connection to me. Cast a wide net to capture all your ancestor's siblings and their children. If you don't want to go that far, at least gather all your ancestor's siblings. Say you find your 3rd great grandmother's birth record. Now you know your 4th great grandparents' names. Next you can search the surrounding years for babies born to the same couple. Find those siblings and you can begin to identify your ancestor's close cousins. You're going to want those names when you're reviewing your DNA matches. 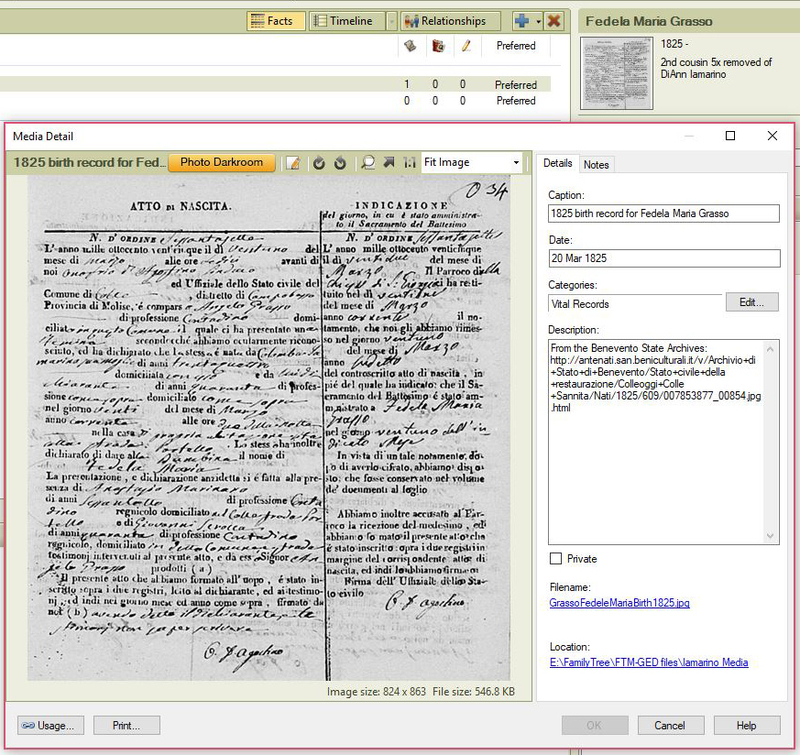 There are a lot of talented programmers out there creating free genealogy software. 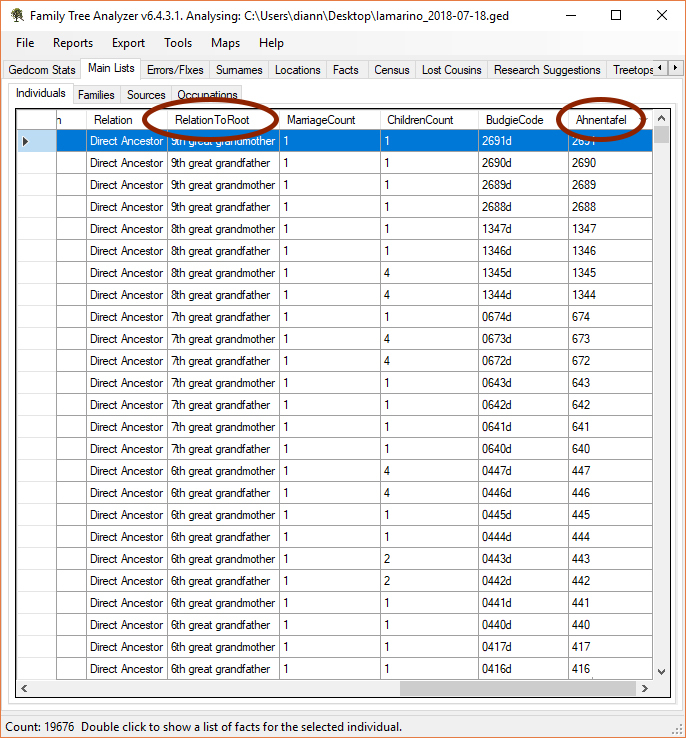 I finally gave up trying to write my own program when I found Family Tree Analyzer. This program takes the germ of an idea I was playing with and puts it on steroids. 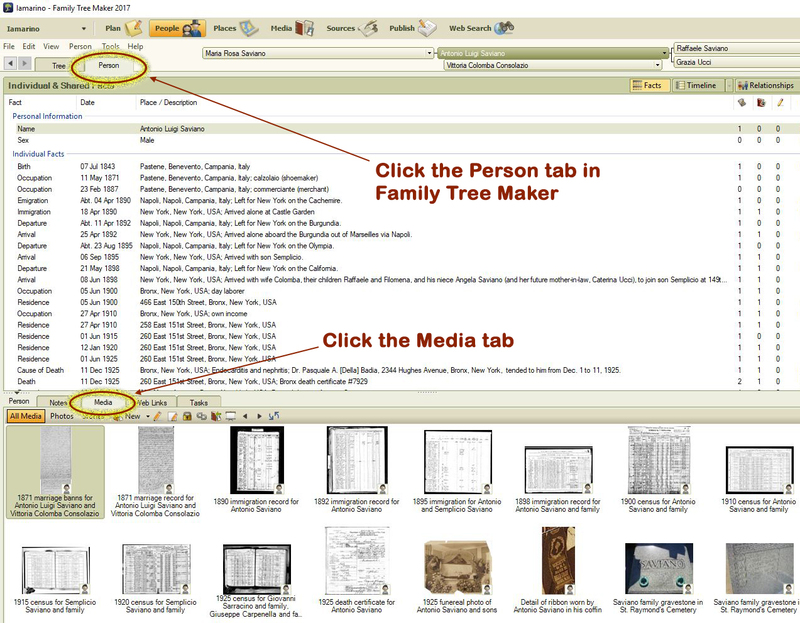 You can run reports, correct errors, and slice-and-dice your family tree in a bunch of ways. And thank goodness I found GetLinks. 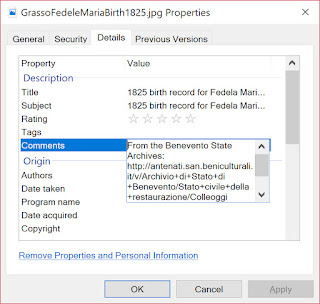 Using GetLinks, I easily downloaded thousands and thousands of vital records from 7 of my ancestral hometowns in Italy. Don't do things the hard way when other genealogy whizzes have created a solution for you. Please continue to part 2 of this article. I get into the nuts and bolts of my genealogy philosophy with 3 more building blocks.